An enclosed carrier auto transport service will deliver sports, luxury, antique, and exotic cars across the United States in a protected environment to keep your investment safe. Without a doubt, driving your specialty vehicle cross-country would be an adventure, but new business ventures, job relocation requirements, and vacations don’t always allow for driving time. Our auto transport companies have enclosed carriers subject to strict regulations that will keep your car safe no matter what city or state you’re moving to. All you have to do is get a shipping quote to find out how much it will cost, and then confirm the details to get your shipping plan for your priceless car underway. What is Enclosed Carrier Auto Transport? An enclosed carrier is a vehicle (truck) that transports your automobile (or other goods) in a contained environment. A standard semi-truck shipping goods is an enclosed carrier. Specialty vehicle haulers to move NASCAR and Indy 500 vehicles are usually carried on enclosed carriers. Ships and airplanes are carriers, but our companies ship specialty vehicles to the 48 contiguous states, so we’re all about trucks. The Federal Highway Administration glossary states a carrier is a firm that transports people or goods. There are different classes of carriers based on operational revenues. If you don’t have time to drive your car because you’re busy operating your business or masterminding vacation plans, our enclosed carrier auto transport drivers will deliver your car to another state for you. If you have a sports car, luxury car, classic car or exotic car, you’re probably already good at making decisions. But as you know, investments require scrutiny. An enclosed carrier will be more expensive than an open car carrier. Will the extra cost be worth it? Only you can decide. The first step is to get a free quote on shipping your car to another state so you can see how much it will cost. Weight, mileage and seasonal fluctuations will affect your quoted price. If you’re flexible, change the variables in the shipping quote to get the best price for shipping vehicle based on your scheduling obligations. Should I use an Enclosed Carrier to Transport My Exotic Car? Do I need to transport my car to another state? Is the car drivable, or will I have to invest money in my car? Do I have time to drive my car to the new location? How long will it take to drive my car to the new state? What earnings will I lose in that amount of time? Is my car worth the investment of shipping with an enclosed carrier to transport my car? Is shipping with an open carrier an option, or do I need more protection for my car? Am I willing to put extra wear and tear on my sports car, luxury car or classic car for this move? You can complete the comparative analysis after you get a free quote on the cost to ship your car. If you choose to ship your car with an enclosed carrier for auto transport, our stellar automobile transporters will take the utmost care to ship your vehicle safely to its new home state. Obviously, if you’re stuck moving in the winter, you want to ship your luxury car in an enclosed car carrier so you can show off a pristine, shiny body on your meandering summer drives. Salt is a corrosive, and is a cancer to cars, but salt is like chemotherapy. Accidents can be reduced by 20% when road salt is used in the winter, and if you’re not alive, you won’t be around to drive your luxury car. Unfortunately, scientists haven’t developed the perfect road salt (but they are trying). Put a nail in salt water and it will start corroding in days. That’s your car on an open car carrier in Chicago during the winter months. But, summer has its demons too. If you’re transporting your car along the Pacific or Atlantic coasts (think Los Angeles to San Francisco or Hoboken, New Jersey, to Miami, Florida), salt from sea spray can be just as bad. Long term exposure to the sun can ruin the paint on the body of your luxury car. An enclosed car carrier auto transport company will protect your car from the unhealthy salt and body-ruining sun exposure it would otherwise be exposed to if it was shipped on an open carrier. 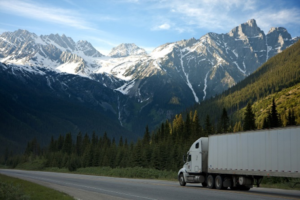 Our auto transport services cover routes across the United States in all weather conditions. Our shipping form will tell you how much it will cost to save your car from salt and get it delivered corrosion free to your destination point. The cost to ship your car in an enclosed carrier will vary with the season. June, July and August are some of the busiest moving months and prices go up. Shipping your car North in the winter will likely be cheaper than shipping your car South for the winter. When you’re reviewing your instant shipping quotes to see how much it costs to ship a car in an enclosed carrier, you have the option to submit new quotes with a different time frame to see if there is a price fluctuation. If you ship your car from Denver, Colorado to Miami, Florida every year during Snowbird shipping season, it may be cost-effective to swing your shipments to accommodate a late fall arrival. What are the Standards for Enclosed Carrier Auto Transport? Our skilled enclosed carrier auto transport companies want what’s best for your car. Luxury Mercedes, BMWs, Lexus, Audis, sporty new Ford Mustangs, Porsche GTs, Stingray Corvettes, 1932 Roadsters, Chevy Hotrods, Custom Harley Pickup Trucks, and even an exotic 2017 Ferrari Convertible are subject to transport requirements made under the departments rooted into the United States Department of Transportation. The Federal Highway Safety Administration (FHSA) sets forth requirements for transporting vehicles. Cargo drivers, such as drivers of enclosed carriers for auto transport, also follow the FHSA driver handbook. Each cargo securement system must be able to withstand a minimum amount of force in each direction. Forward Force = 80% of cargo weight when braking while driving straight ahead. Rearward Force = 50% of cargo weight when accelerating, shifting gears while climbing a hill, or braking in reverse. Sideways Force = 50% of cargo weight when turning, changing lanes, or braking while turning. Upward Force = 20% of cargo weight when traveling over bumps in the road or cresting a hill. The sum of the working load limits from all tiedowns must be at least 50% of the weight of the cargo. Also, there must be tiedowns at the front and rear to prevent movement from side-to-side, forward and backward, and vertically. Luxury car auto transport companies take special care (and pride in their work) to protect your car during the tie-down process. Drivers of enclosed carrier auto transport vehicles are required to inspect the cargo (your luxury vehicle) before, during, and after the shipment to ensure that your vehicle stays secure. Enclosed carrier auto transport companies are required to be bonded, carry cargo insurance (up to a certain limit), and produce a certificate of insurance. Though if you’re transporting a million-dollar vehicle, you may want to get added insurance protection to protect your exotic car. Get the best quotes from our skilled enclosed car carrier auto transport companies. Confirm the dates and window of delivery are suitable for your schedule. Determine where the pickup and drop-off locations will be. Determine who will take care of the pickup and drop-off. Discuss the scheduled window of delivery dates with the auto transport carrier. Ask the enclosed-carrier transport company how to prepare your car for shipping. Ask to see the carrier company’s certificate of insurance. Review the background of the carrier on the Federal Motor Carrier Safety Administration (FMCSA) website. Read the fine print or have your lawyer review any documents you sign if you have questions. Review and confirm the details of luxury service, addons, date, time, inspections, preparation, pickup and drop-off provided by auto transport company. Update your calendar with pickup and drop-off dates. Prepare your car for delivery (waxing adds protection). Take a picture of your car before it is dropped off. Take a picture of your car when it is delivered. Give your car a fresh wash and polish after long carrier ride. Take your luxury car out for a sporting, enjoyable drive! The sooner you get the plans in gear to ship your car, the sooner you can get back to your productivity or well-deserved vacation. Our expert enclosed carrier drivers will protect your luxury car throughout the interstate transport journey. An enclosed carrier is worth the investment. Move your exotic car safely, and smoothly, with experienced enclosed carrier drivers. We have enclosed carrier drivers available to ship your luxury car to another state, so you can make plans today. You know what you have to do. Get your free quote now so you can get back to creating your enjoyable life. Time is certainly worth money.